The Israeli Air Force carried out, on Thursday at dawn, several air strikes targeting a number of areas, and resistance camps, in different parts of the Gaza Strip, causing excessive property damage but no injuries. 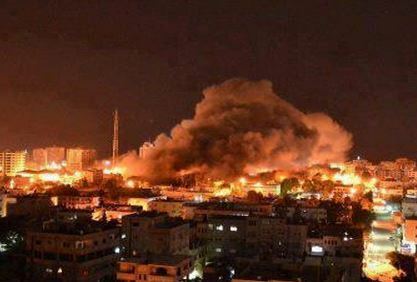 Israel claims the bombardment came in retaliation to shells fired from Gaza. Media sources said the Air Force fired two missiles into a site run by the al-Qassam Brigades of Hamas, near the al-Maqousi Towers, west of Gaza City. The bombardment caused excessive damage to the site, in addition to nearby homes and property. Another Israeli missile targeted a site southwest of Gaza city, also causing damage to the site, and several nearby homes. Two more missiles were fired into a site located northwest of Khan Younis city, in the southern part of the coastal region. The shelling came after Israeli fighter-jets conducted various flights over different parts of the Gaza Strip, firing flares, and causing sonic booms. The army added it managed to determine that three missiles were fired towards Asqalan, two towards Shear HaNegev, and that one of the missiles was fired from an area close to the shore, west of Gaza, while another missile was fired from the site of the former Netzarim settlement, south of Gaza. Israeli Opposition leader, Yitzhak ‘Bougie’ Herzog, also held Hamas responsible, and “expressed solidarity with residents of southern communities’ (settlements close to Gaza). Member of Knesset, former head of the Eshkol Regional Council of Settlements, Haim Yellin of the Yesh Atid Party (There Is Future) called for a “fierce retaliation,” and said that the reconstruction of Gaza must be preconditioned with disarming all armed groups in Gaza. Late on Wednesday at night, Israeli sources said two shells were fired from the Gaza Strip into southern Israel causing no damage or injuries.